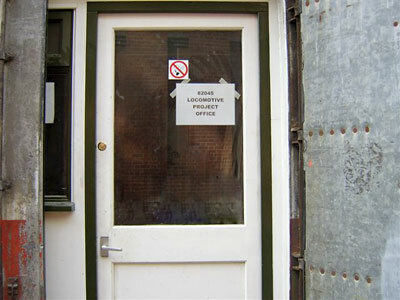 Two photos of the pattern for the pony truck centre. This is the pattern for the hornstay. 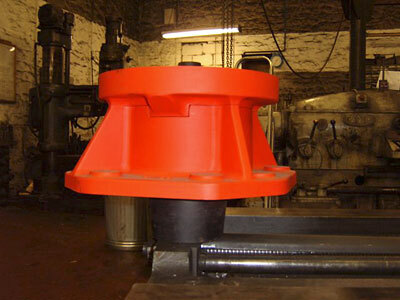 A production casting of a hornstay, taken from the pattern above, on the milling machine. This casting is actually for 43106. 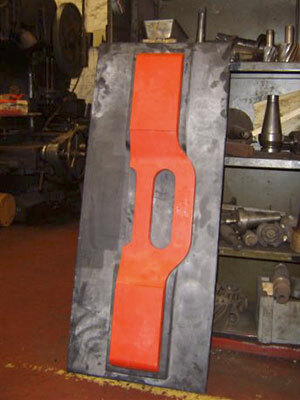 Finally, further progress with fabrication of stands for supporting the frame plates. Everyone with an interest in heritage railways must by now be aware of the devastation suffered by the Severn Valley Railway as a result of freak storms in June and July. Please do all you can to support the railway to a speedy return to normality even if it is just recommending a visit there in 2008 to your friends. In this context we can all be personal SVR publicity agents. Remember the Severn Valley is a seven day a week operation from May through to the end of September with plenty of trains midweek as well as at weekends. Our members' meeting on 4th. August at Kidderminster was regrettably poorly attended. A number of items on the agenda could not therefore be properly discussed. One of these is the need to review our organisation to take account of the necessity of protecting The 82045 Steam Locomotive Trust from any claim for compensation against us as a result of an injury to any person resulting from our activities. Such is the world in which we live, that if a burglar breaks a window gaining illegal entry to your house and then injures himself climbing through he will in all probability attempt to sue you for compensation. Our legal knowledge is limited so we have sought advice as to the best course of action to adopt, which we are now considering. However if there is someone out there who would like to assist in the administration of The 82045 Steam Locomotive Trust and feels able to take such legal and constitutional matters under his or her wing please make yourself known. We would also be delighted to hear from someone with a talent for fundraising. We have presented our proposals to and held a meeting with the Office of Rail Regulation. By adhering to the original BR drawings for the Standard class 3 and using the same materials or their present day equivalent, it appears that there may be fewer bureaucratic hoops to jump through than would be the case if we were to modify aspects of the design or introduce novel features. 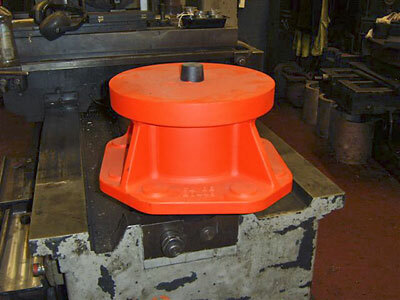 The arrival of the frame plates at the SVR in April prompted some publicity in the news pages of several of the monthly magazines. Unfortunately some of these journals omitted to print our contact details at the end of their report. However Heritage Railway did us proud with issue No.102 at the end of August by publishing a feature article written by Chris on the 82045 project entitled "Bringing a Standard back on the Severn Valley". Many thanks to the Editor. At around the same time our completely new website went live at www.82045.org.uk. We are extremely grateful to Paul Bennett for his excellent work on this aspect of our activities. If any member would be happy to view the newsletter in future on the website and print it off themselves if necessary, rather than receive the paper version through conventional mail, please let us know. The original plan had been to move the frame plates to the site earmarked for us at Bridgnorth by rail before the end of the summer. However mother nature's enforced closure of the line north of Bewdley put paid to any such aspirations and we have to await a suitable opportunity when the northern section has reopened. We have not been idle though and are fabricating some stands to support the frame plates in the upright position when they arrive on site at Bridgnorth. Subsequently plans are being formulated to purchase the buffer beams for which we have a promise of some financial assistance. We already have four secondhand buffers to be attached, when overhauled and painted. Many of you will be aware of the major overhaul taking place at Bridgnorth of LMS class 4 2-6-0 No.43106 of H.G. Ivatt design. The chassis of the BR Standard class 3 engines was based upon the chassis of the Ivatt design class 4, although a different boiler was used with a view to keeping the overall weight of the class 3 locomotive down. This has not gone unnoticed in Bridgnorth works and some patterns have been produced by the in house patternmakers for 43106 which will be equally useful for 80079, 75069 and 82045. We have purchased further drawings to assist in this area. 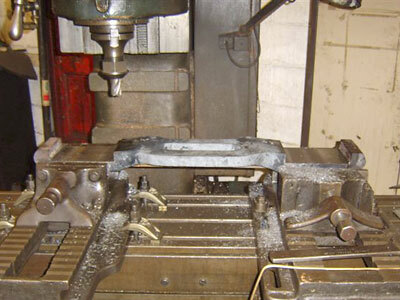 Drilling of the two frame plates is a matter for early consideration. 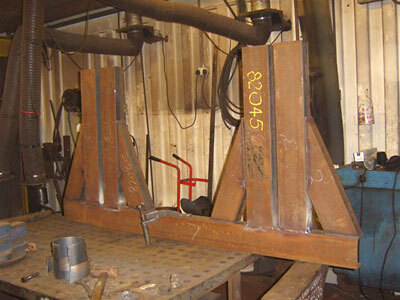 We obtained two quotes from non railway engineering companies early in the year before the frame plates were delivered. These quotes were very expensive and we could not proceed at the time. However the job must be tackled before much assembly work of the frames can take place. After that there is no end to the components that can be made and fitted, but it all hangs on finance. We are well aware that it is not everybody who can spend large sums on a hobby activity. However several members are making modest monthly payments to The 82045 Steam Locomotive Trust so please consider our future locomotive if you can help further. We anticipate attending the next BR Standard Locomotive Owners Group meeting on 3rd. November at the Llangollen Railway. As mentioned in our newsletter No.6 one of the BRSLOG members is seeking support towards placing a bulk order for the Gresham & Craven graduable steam brake valve. We would like to be a part of this purchase order for the obvious price advantage that would occur. We must be in a position to be able to take advantage of such bulk purchases of components when the opportunities occur, which may be only once in a lifetime. Your financial support is therefore crucial. At the last BRSLOG meeting earlier in the year we were offered an item of brake rigging. We had to ask the BRSLOG member concerned if he would consider putting the matter on hold for the time being due to the fact that we were about to pay for the frame plates. We do need that little extra in reserve to cover such unexpected offers that may come our way and thus avoid paying a much inflated price some years later.